Traditional microarray data analysis generally assumes Gaussian measurement noise – despite the sensitivity of the Normal Distribution to outliers. 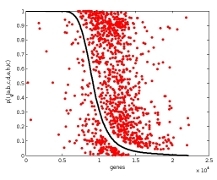 Especially for high-dimensional microarray data, Gaussian models are popular because of their computational efficiency in comparison to alternative approaches. We report on the first systematic study of the impact of noise model choice and its biological relevance. A hierarchical Bayesian model allows the principled direct comparison of Gaussian models and robust alternatives. Interestingly, heavy-tailed distributions were the best fitting models for all the examined data sets, spanning a wide range of experiment types and measurement platforms. Moreover, application of an appropriately heavy-tailed t-distribution resulted in substantial changes for differential expression analysis, strongly affecting the functional categories implicated. Traditional microarray analyses relying on a Gaussian noise model thus not only distort results for	individual genes but yield biased conclusions even at the higher level of functional categories. In contrast, experimental evidence strongly supports heavy tailed alternatives, and different robust approaches agree well with one another.